This is a double CD-R pressing of the bands long concert at Space Farm Ahoi in Austria. 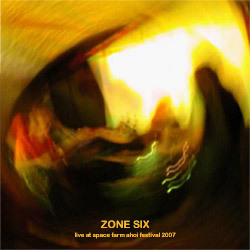 The First CD is 3 tracks and 41 minutes and starts off slow and spaced out as is often the case with these totally improvised psychedelic music bands. Sunhair provided the good quality audience recording. It is a good way through the opening number (Ahoi) before Julius K takes off with a guitar solo over the stoned groove. They exit that jam and enter Flunkytoffel, which is uptempo and driven by some very cool bass runs by Dave. Sadly, you can’t really hear Martin much except when the band is quiet. My Schlawiener is 20 minutes and ends the first CD and is real psychedelic tranced out stuff.. Takes you in circles.. CD2 is three tracks and 65 minutes. It begins with Allwahn and is very spacey and slow stoned trance stuff as well. A bit like a stoned version of the Finnish band Circle. Fehlstart is in a similar vein with a slow stoned groove and quite repetitive at times. Eventually Julius takes off with some cool guitar. Langzu is 33 minutes and ends this double CD-R. This track begins with a bit of noise and is a bit more intense at times than most of the rest of these very tranced out tracks, perhaps some of the most tranced out the band have produced. A really amazing jam and great way to end this show.